Operates between John Deere Financial in Johnston and downtown Des Moines. 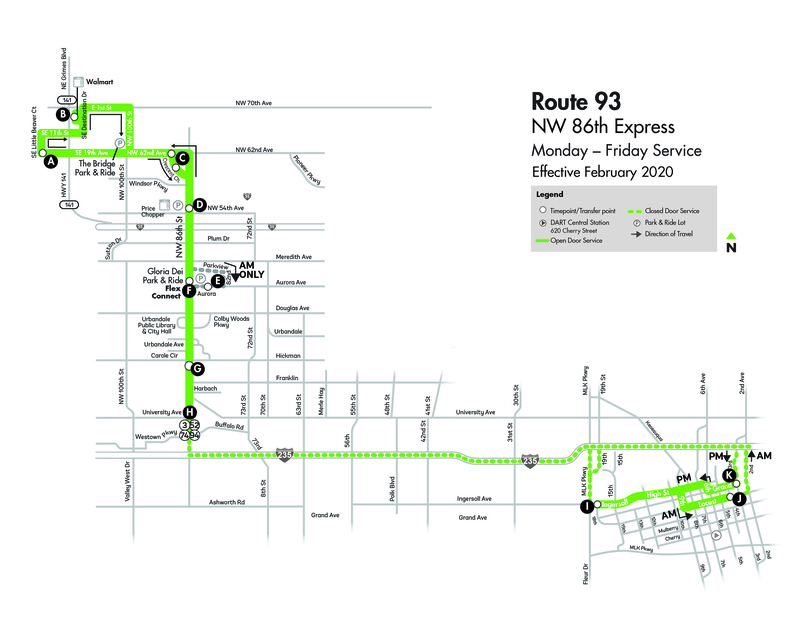 Guaranteed Ride Home: In case of an emergency, DART will guarantee a ride home to individuals riding Route 93 -- 86th St, between the hours of 8 a.m. and 3:30 p.m., Monday through Friday. To qualify for a Guaranteed Ride Home, you must be a monthly bus pass holder, Unlimited Access participant or RideShare vanpooler. For full program details, click here. ^ These buses travel to the garage via I-235, MLK, Ingersoll and 9th and will stop at downtown bus stops along 9th. LEFT (south) on Crescent Chase to Stone Point Lane. RIGHT (south) on 3rd Street to Grand Avenue.